Mention of the Sunshine Coast in Australia will without a doubt bring to mind the beach. While this Queensland vacation favourite’s warm weather, golden shorelines and perfect surf breaks are drawcards, for those who bore easily lying on a towel in the baking heat, the Sunshine Coast has plenty of other activities and attractions too. If you don’t like getting sunburnt and sandy, here, we cherry-pick the best things to do on the Sunshine Coast that aren’t the beach. Not far from Noosa’s resorts and boardwalk, you’ll find an altogether different vibe in Eumundi. 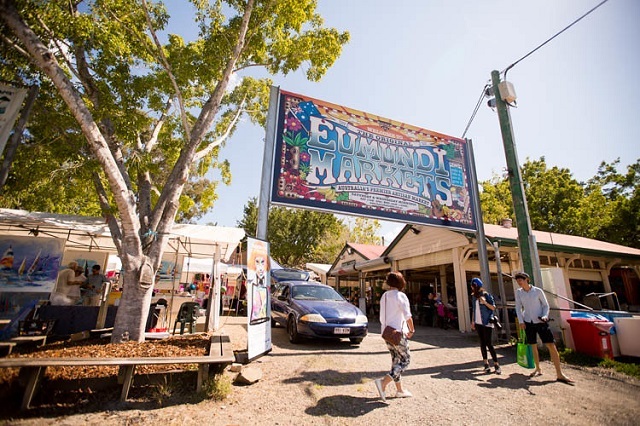 This inland hippie hub – with its main street lined with vegetarian restaurants, herb and crystal shops, and prayer flags – sees creative locals gather several times a week to run one of Australia’s biggest art and craft markets. With almost 600 stalls offering handiworks, massages, food and drink, and metaphysical fun, it’s a great way to spend a Wednesday or Saturday morning (it runs until around 2pm each day). Even when the markets aren’t on, the eclectic atmosphere of this area is worth checking out. If you’re staying at the other end of the Coast, another top market to peruse is the Caloundra Street Fair, which is on every Sunday and has almost 200 stalls. Where there’s a coast, there’s a hinterland, and the Sunshine Coast’s is especially diverse and lush. The Great Walk is a network of trails that traverse the Blackall Range, winding through subtropical rainforests and Eucalyptus trees to provide a peaceful escape from the Queensland heat. The entire walk runs for close to 60 kilometres, but you can dip in and out on full- and half-day hikes, or choose from shorter circuits and there-and-back tracks. There are also freshwater dams to cool off in along the way, and a few walks that culminate in lookouts with stunning, far-reaching views. For the Free Solo fans, there are plenty of mountains to climb on the Sunshine Coast. The distinctive outline of the Glasshouse Mountains, which you can see from many parts of the Coast, is one of the most popular spots for the activity. 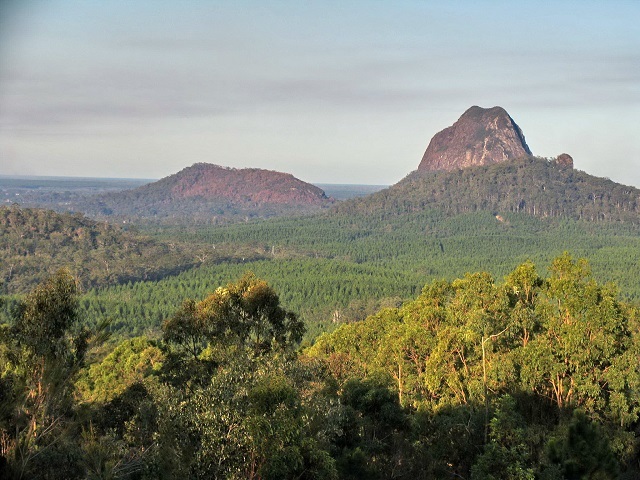 There are five domes to tackle with varying degrees of difficulty (Mount Beerwah is the highest at 556 metres), and this protected area is home to an assortment of landscapes, plants and wildlife. Other top peaks to seek out include Mount Coolum, with spectacular ocean views from its summit, and Mount Allan, which is a challenging ascent through bushland but has the Booloumba Creek at its base to cool off at the end. If you want to enjoy the wilderness of the Sunshine Coast, but aren’t up for precipitous climbs or jumping into bodies of water from up high, low-key options such as the Mary Cairncross Scenic Reserve might be for you. This attractive picnic spot features a short, educational loop with placards detailing the native plants and wildlife, making it a nice place to take the kids. There’s also a casual cafe to one side if you want to complete the loop and not have to BYO food. 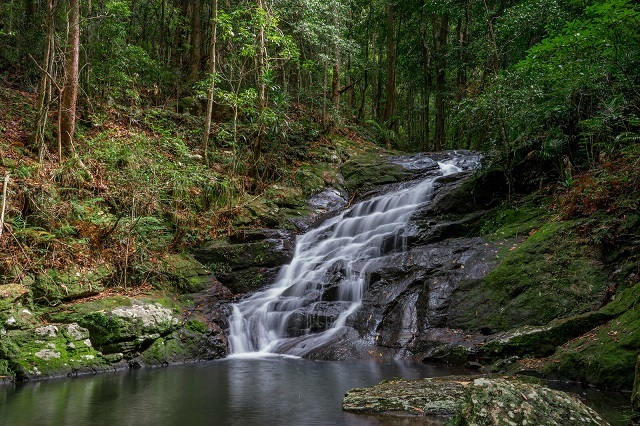 The Sunshine Coast hinterland is also home to many picturesque waterfalls, with one of the most famous being Kondalilla in the Great Walk catchment. There’s a picnic area at the entrance to Kondalilla Falls, and you descend several stairs to reach the creek at its foot. This tall, majestic waterfall surrounded by cool rainforest is a favourite destination for families during summer. More of a local secret is Gardners Falls, where adrenaline-seeking teens often swing out on the rope into the pool under its stream. If you aren’t game for that or have little ones, there are also smaller, shallow rock pools to wade in. The smooth expanse of rock at the top of Gardners Falls is a good place to take a break for lunch or to thaw out after a swim. Montville and Maleny are two backland areas with loads of charm. Maleny has a free-spirited style, and its lush dairy country is incredibly pretty too (don’t miss sampling some of the region’s cheeses). The surrounds of this town have the aforementioned waterfalls, walks and parks, plus a Botanic Gardens and the popular Baroon Pocket Dam. But people also visit to enjoy a meal with a sweeping view, indulge in sweet treats such as ice cream and fudge, and browse the artsy shops. Up the road from Maleny is Montville, which has a similar offering but a more quaint, storybook-town feel. This village, established in the 19th century, features European-style architecture and a tree-lined main street that people love to wander. Eager to tick off some of these things to do on the Sunshine Coast? Book flights to the Sunshine Coast with Webjet, or find flights to other destinations, such as the Gold Coast, Brisbane or Cairns, to get your Queensland holiday started today.